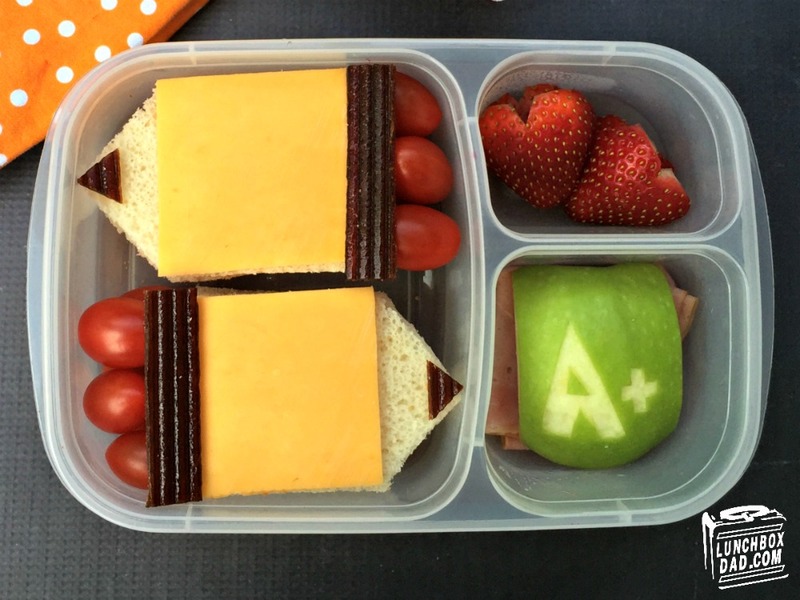 The beginning of the year marks a fresh start when it comes to your kid's school. 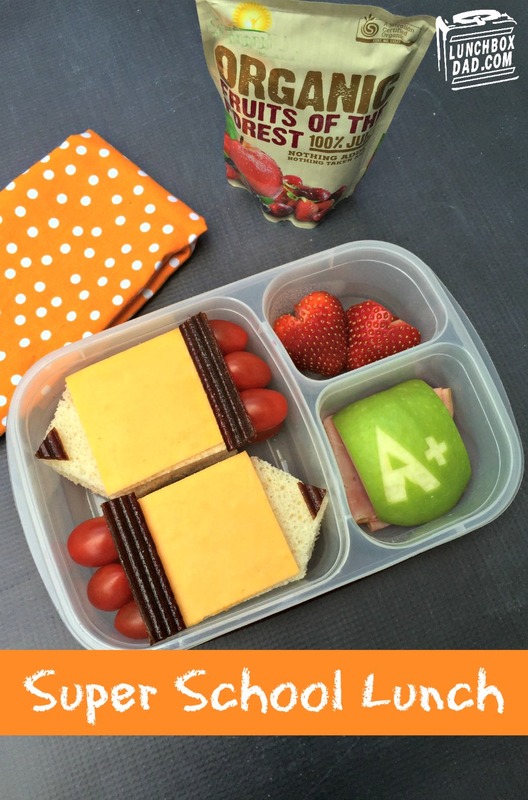 It means that you can help encourage them and let them know you are thinking of them by making a fun lunch like this school themed one! It is healthy and tastes great! Just remember to slip in a little note to tell that you love them as well! I made this in an Easy Lunch Boxes container. Remember to follow me on all my social media channels to get tons of great ideas as we kick off this new year! My social links are on the right of this page. 1. Cut a slice of bread in half and cut the end in a triangle shape. Repeat until you have four pieces. Stack two pieces on top of each other. Cut cheddar cheese into squares and place on top of bread. Trim fruit leather into two narrow pieces and two triangles. Place where shown on bread. Kids can make their own cheese and meat sandwiches from these! 2. Place sandwiches in main container and put grape tomatoes on the end as an eraser. 3. 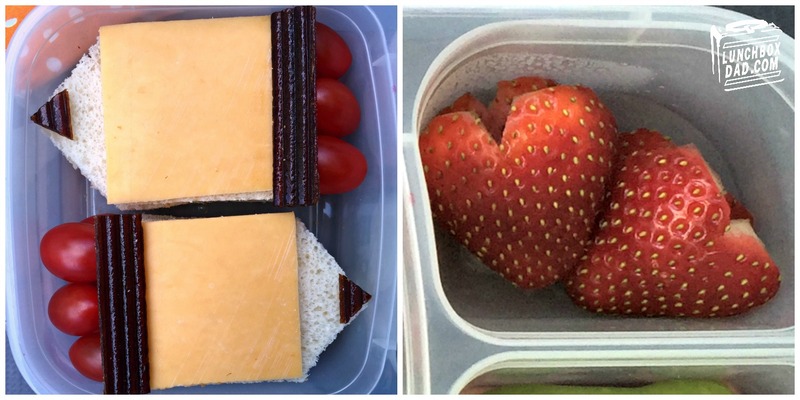 Slice strawberries in half and then shape the top to form a heart. Repeat and put in side dish. 4. Cut apple in half. Use a sharp knife and make shallow cuts to make the A+ out of the skin. Place sliced meat in side dish and then put apple on top. If needed, put a little lemon juice on apple to stop it from going brown.